Batter Up! Next Storm System Rolls Into the Region on Wednesday! The picture on this storm is becoming a bit clearer as we get more data in. This will be another tricky forecast (I’ll discuss why a bit further down the page) but basically most areas along the front range won’t see a whole ton of snow out of this. Some very specific areas will have the chance to bust high on the snowfall forecast again, that combined with quick bursts of snow and some wind means travel conditions will likely be tricky for the commute Wednesday night. Winter Storm Warnings for the mountains are up for hazardous travel conditions due to heavy snow, strong winds and snow accumulation. For the front range of Colorado, a Winter Weather Advisory is in effect for primarily travel difficulties. wind chills as low as 25 below zero could cause frostbite on  exposed skin in as little as 30 minutes. WPC most likely snowfall for this storm, it’s pretty in line with our forecast. Models as of this afternoon still favor areas around and North of Denver for more of an impact with less of an impact along the Palmer Divide. The turd in the punch bowl (excuse the expression) for this storm is thrown in when we look at the snowfall models coming out this afternoon. They’re back! 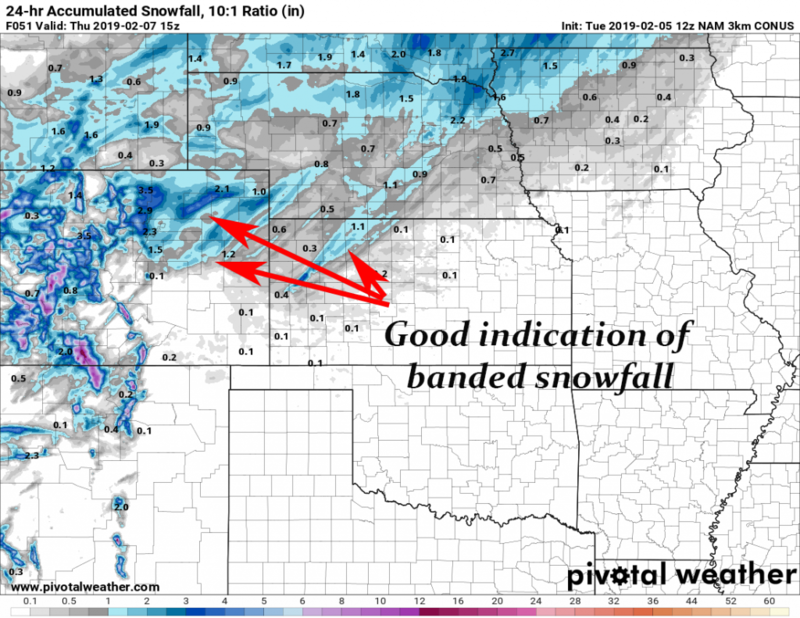 Given the storm setup aloft and the fact that we can see banded snowfall on the models means some areas will not fall within their forecast snow range. We can see pretty clearly on some of the higher resolution models that there will be bands of heavier snowfall along with this storm. Given the strong flow aloft out of the West and Northwest, this is something I’d expect even if the models didn’t pick up on it. All we can tell you based on this information is that some areas will see higher snowfall amounts than what is forecast. 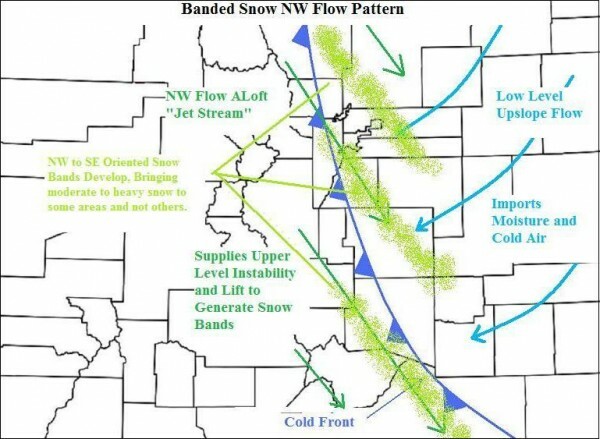 For what it’s worth models tend to be keeping the heavier snowfall bands in and around Denver and points to the North. That doesn’t necessarily mean a thing, just figured I’d point it out! All in all, this storm will be like the past couple we’ve seen. With the jet overhead to enhance lift in very specific areas and moisture and up slope establishing with a cold front moving in; I’d expect this storm will be mainly just a headache for most folks. Those that do get lucky enough to stick under those snow bands for awhile will graduate this storm beyond a headache to a pain in the rear. We’ll be keeping an eye on this storm as we get more data into the evening. Probably expect at least one more post or two up late tonight and perhaps tomorrow morning if things start to change.